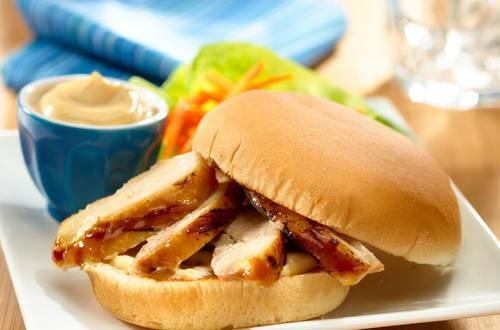 Add some spice and flavor to your grilled chicken sandwich with this easy and tasty Asian Marinated Chicken Sandwich recipe. 1 Whisk together Hellmann's® or Best Foods® Real Mayonnaise, soy sauce and garlic powder in small bowl. Remove 1/4 cup of mixture cover, and reserve, refrigerated. 2 Whisk orange juice into remaining mayonnaise mixture. 3 Pour 1/4 cup marinade over chicken in medium nonaluminum bowl or resealable plastic bag; turn to coat. Cover, or close bag, and marinate in refrigerator, turning occasionally, 3 to 8 hours. Refrigerate remaining marinade. 4 Remove chicken from marinade, discarding marinade. Grill chicken, turning occasionally and brushing frequently with 1/4 cup of the refrigerated marinade, 12 minutes or until thoroughly cooked. 5 Divide reserved Mayonnaise, soy sauce and garlic powder mixture between 4 buns. Grill buns until browned. Slice chicken and serve in buns.